John Sparks’ varied legal background involves Commercial, Insurance, Native American, Gaming, Energy, Regulatory, E-Commerce and Health Care litigation and transactional matters, including: Insurance Bad Faith, Drug and Medical Device, Medical Malpractice, Wind Energy, Real Estate Transactions, Zoning, Construction, Internet, Employment, Wind Energy and Oil and Gas matters. He is admitted to practice before all Oklahoma State and Federal District Courts, the 10th Circuit Court of Appeals and the District of Columbia, as well as the Courts of the Cherokee Nation of Oklahoma and the Chickasaw Nation of Oklahoma. John is an enrolled citizen of Cherokee Nation. Since 2016, John has served as the Chair of the Cherokee Nation Gaming Commission. The commission is the independent tribal gaming regulatory authority established within Cherokee Nation. The commission ensures the fairness and integrity of gaming activity within Cherokee Nation gaming facilities, as well as to protect Cherokee Nation’s assets. In 2018, he was awarded the Cherokee Nation Stateman Award. 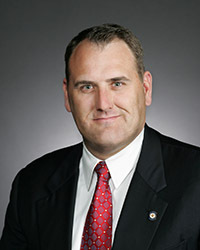 From 2006 to 2018, John served in the Oklahoma Senate where he served as the Democratic Leader. He also Co-Chaired the Senate Insurance and Retirement Committee and served as a member of the Senate Committees on Appropriations, Education, Finance, Military & Veterans Affairs, Redistricting, Select Committee on Pensions, the Joint Committee on State-Tribal Relations and the Joint Committee on Federal Health Care Law, a special legislative committee which studied how the Federal Affordable Care Act affects Oklahoma. Before forming this firm, John was a principal at Corner Post Management & Consulting, LLC. He worked with entities which provided specialized Medicaid and Medicare services, as well as advised individuals, employers, health plans and health providers on current policy trends and issues related to the development of increased quality of health care and payment systems. Prior to that time, John was with the law firms of Crowe & Dunlevy and Foliart, Huff, Ottaway & Bottom. The majority of his practice at these firms focused on commercial, insurance and health care litigation representing insurance companies, their insured parties, health care providers, professional liability, regulatory, insurance bad faith litigation, licensure proceedings, medical malpractice, credentialing and construction companies and construction bonding entities in various types of contractual disputes. A 1994 graduate of the University of Oklahoma College of Law, John was a member of the American Indian Law Review. In 1991, he earned an A.B. in Economics from Harvard College, where he was an All-Ivy Defensive Tackle. During college, John worked for then U.S. Senator David L. Boren and for the National Indian Gaming Commission. Upon graduation from law school, he served on the staff of Congressman Bill K. Brewster, working on legislative issues such as energy, agriculture, Native American affairs, the environment and international trade. John is originally from Sulphur, where he continues to be actively involved in his family’s ranch. He and his wife, Elizabeth Sneed Sparks, have two sons.